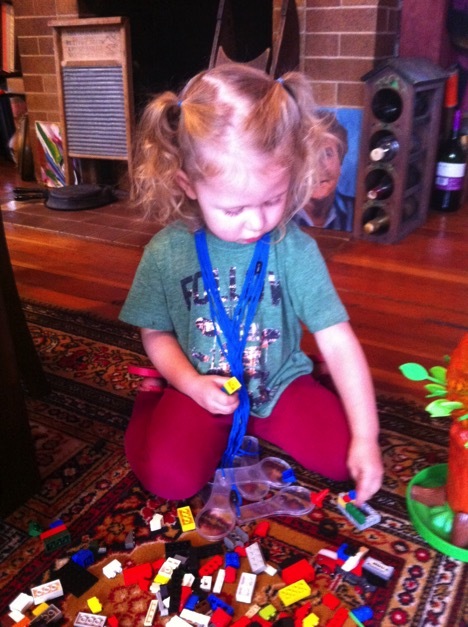 Today I had the pleasure of spending an afternoon with my niece’s daughter, Avalon Rose, aged 2 ½. She was such a reminder of how children learn through doing, by being in their environment. Armed with magnifying glasses, shovels and garlic clusters that missed their Spring Time planting, we went for a walk around my garden. We dug in the dirt and checked out ants, spiders, woodbugs and rocks. We stopped every few feet to discover another plant or flower, looking closely with our magnifying glasses, pulling the seeds off and discovering their shapes, sizes, colours, and how they travel. I now have many variety of grass transplanted into my flower beds…. We went to the herb garden and smelled peppermint, oregano, thyme and marjoram. She announced that there were grapes growing, and raspberries. “ What’s that sound, Karen?” to the calls of crows, seagulls and distant trains. Then, onto the fish pond to feed the fish. “How much food?” “The baby food or the big food?” We discovered that there were babies sporting shades of grey, silver and light orange, and bigger fish of orange and white. From here, we traveled onto the deck where she had a little lay down with the cat, Frenchie on the hot tub cover. This lesson took all of an hour and fifteen minutes. She, as all children, used every sense to learn more about her world, and build on past understanding with each new discovery. This is our natural way to learn. How does this translate to learning to read the word? If we start with things from our concrete environment that have meaning, then we can use these to build on. We can introduce the abstract system of shapes and sounds that is our English language. So, the letter ‘f’ is now related to fish and flowers and fast, the long e sound is in tree, seed, leaf, and bee. Peppermint is associated with a scent, and the shape of a leaf. I often suggest activities focused on the sounds, rather than the shape of a letter. 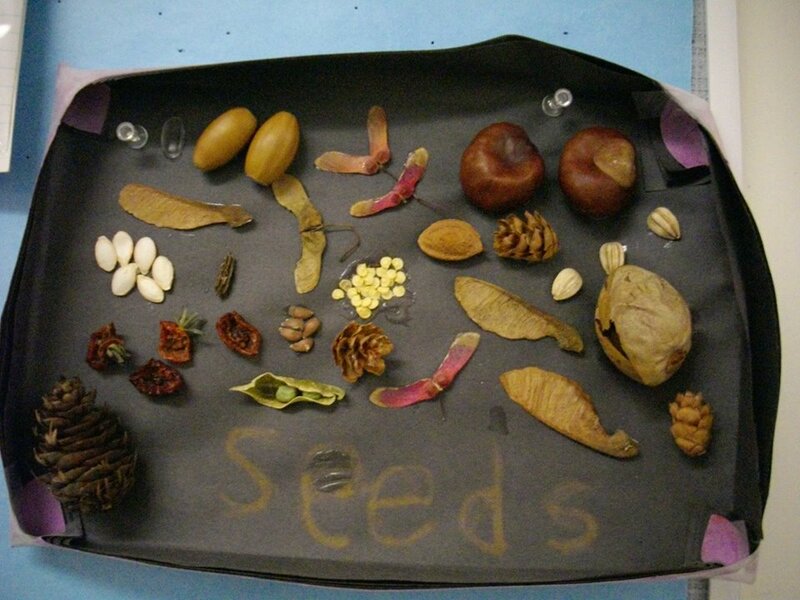 So, a snake is shaped like an S, and makes a sound like ‘SSSS’ It is also the sound at the beginning of the word seeds, so a follow-up activity could be to collect those seeds, and glue them onto a large representation of the word SEEDS, making the seeds form the word. This is the image that stays in the memory system. Another activity is to introduce a sound, and go on a search, collecting physical examples around the house or yard, or, in this age of technology, by taking pictures for the sound of the day. Scrapbooking is an excellent way to collect artifacts from all of your experiences. This is not the fancy, and costly type, just a regular old style scrapbook to tape, glue, draw, add photos and ticket stubs, maps, pamphlets into. It’s a way to track all your experiences, and then use those later to make connections, add letters, words, scribed responses. It can contain collections – rocks, leaves pressed flowers, seeds, shells…there are no limits to collections. It can show different environments that are part of your child’s life- the backyard, the beach, the forest, your favourite park, and later, this can lead to observations of similarities and differences between different places, and during different seasons. It can be a place to record ‘All About Me’ items including likes, dislikes, family, and traditions. When I am conferencing with young children, and their portfolio includes a personal scrapbook, this leads to the proud sharing of favourite times, and helps me connect with the child, as well as to help them make connections between the important events of their lives, and eventually a connection to the written word. “ What did you like best at the park? Let’s write that here. “ I often suggest scribing for children so that they recognize that a specific image has a related set of symbols. Too often, learning to read and write consists of copying the letters of the alphabet, on lines, with a foreign tool called a pencil. This is hard work for little hands. Not only do they have to figure out how to hold the tool, but then, how to copy a shape, that has no meaning, or purpose. Copying single letters has no meaning connected to it. It doesn’t communicate anything. Think of the letter ‘W’. We say ‘double U’, but it’s shape is a double set of ‘V’. And then, look at the sound! Recently, I had a child telling me letter names out-of-order. She commented that she has a hard time remembering that one, as well as X and Y. None of these letters has a connection between it’s name and the sounds it makes – they are abstract, so we need to help find a concrete connection. For example, a W is shaped like a wave, or split in half, like wings on a bird. Paint brushes, clay, yarn, or sand can be used to form a letter shape, or images that tell the sound such a snake for S, mountains for M , tree for T.
I mentioned scribing earlier. Again, there is so much to consider when asking kids to write or respond. They have to think of the word, then break it into sounds, then remember what letter says that sound, and then try to print the letter. So often, the thought is lost, or the response is watered down to a three word sentence because that is all there is energy for. If an adult scribes a story, a response or a retelling in legible printing, then this can be used later for a child to reference when sharing their pictures. Often, this starts with a memory related to the picture they include, but over time, they can begin to follow the printed words, because they already know what they say. They are their words. These opportunities allow the child to take ownership of their experiences, and this becomes ownership of their personal learning journey. As parents or teachers of children beginning the journey of learning about the world, and learning to read the word, it is always important to trust that the process is happening. This can be difficult if that journey takes a route unfamiliar to traditional learning or takes longer than the expected rate of learning. If we push a skill before the brain and body are ready to integrate that skill, it is a wasted effort. However, if we focus on exposing, experiencing, exploring and engaging a child in learning opportunities we are giving them the building blocks to build their own understanding, and permission to determine the rate and route that they need to get there.